Members of Parliament have benefitted from more than £2m worth of free overseas trips in the last two years. More than half were paid for by foreign governments and Saudi Arabia spent more than any other, BBC analysis of Parliament's expenses register reveals. You can see how many trips your MP has accepted in the year since the election by searching below. How many foreign trips has your MP accepted? If you cannot view the search field, click to launch it in a browser. Saudi Arabia, Taiwan and Hong Kong contributed to nearly half of the £1,105,490 worth of travel covered by foreign governments, offering free flights, hotels and meals to their guests. Political links with the Saudi regime have been under increasing scrutiny since the disappearance of journalist Jamal Khashoggi in the consulate in Istanbul earlier this month. See how many trips were made to other countries with our interactive map. Organisations and governments regularly invite politicians on all-expenses paid visits overseas. These are often related to an MP's role in an international organisation or part of a one-off fact finding delegation, all of which form a legitimate part of their role as Parliamentarians. Our research is limited to visits that were declared to Parliament by MPs before 18th June 2018 - some trips before this date were not recorded until later and have not been included. The register of interests does not include ministerial costs or trips taken as part of delegations including Nato and the Council of Europe. The findings come after questions were raised over the travels of Labour leader Jeremy Corbyn and DUP MP Ian Paisley this year. Mr Corbyn's conduct was reported to Parliament's Standards Commissioner after he failed to declare a 2013 trip he took to Tunisia, that was at the centre of the anti-Semitism controversy. MPs must register all trips that are valued more than £600, but the Labour Party claimed that his visit was worth less than the threshold. Ian Paisley was suspended as an MP in July for 30 sitting days after failing to declare two family holidays to Sri Lanka, covered by the Sri Lankan government. By far the most common destination for politicians was Israel and the Palestinian territories, with 102 visits over two years, followed by the USA, Germany and the British Overseas Territory of Gibraltar. Most trips to Israel and the Palestinian territories were covered by pressure groups including Conservative Friends of Israel, Labour Friends of Israel or Medical Aid for Palestine. And most of them were described as "fact-finding missions", visiting both Israel and the Palestinian territories. Nine of the 10 MPs who had the most money spent on them in the year after the 2017 election belong to the Conservative Party, with only Labour's Rotherham MP Sarah Champion breaking the mould after expensive trips to Hong Kong, Taiwan and India. The most expensive traveller in the year after the 2017 election was Leo Docherty, Conservative MP for Aldershot, who went on six trips worth a total of £26,895. Most of this was at the invitation of the governments of Bahrain, Saudi Arabia and United Arab Emirates. Mr Docherty, who ran the Conservative Middle East Council before entering Parliament last year, was part of a delegation invited by the Saudi government to "see the impact of ballistic missile strikes in the Saudi/Yemen border region and gain a deeper understanding of the strategic importance of the Coalition operations in Yemen". His four-day visit in January was valued at £8,257. In response to questions about this trip, Mr Docherty said: "The kingdom of Saudi Arabia has for many years been a hugely important strategically for UK across many sectors." In a contribution to an emergency debate on the crisis in Yemen on 11 September 2017, Mr Docherty defended the actions of the Saudi military, saying: "I am convinced that our influence helps the Saudis fight this war better, and that is extremely important." Mr Docherty also travelled to the kingdom in September 2017 to meet King Salman bin Abdul Aziz Al Saud, two weeks before putting down a Parliamentary question to the then Defence Secretary Michael Fallon, asking "what steps his department is taking to support the sale of a second tranche of Typhoon aircraft to Saudi Arabia". Many overseas delegations are organised by the near 200 All-Party Parliamentary Groups, which are informal collections of MPs and Lords focusing on particular countries or subjects. Mark Menzies - who is a member of 17 of the groups - totalled £22,186 worth of travel over five visits, while David Morris cost £17,894 to governments including Azerbaijan, Bahrain and Armenia. Not all of the invitations were on behalf of governments. The single most expensive trip over the two-year period was taken by former Conservative cabinet minister Andrew Mitchell. The MP for Sutton Coldfield charged £21,157 for a two-day visit to Washington DC with his wife in April 2017 to attend meetings about international development. He was sponsored by the Centre for Strategic and International Studies. John Mann, who registered eight overseas visits on the Register of Interests in the year following the election, the most recorded by any MP, said these trips are "part of the job". None of Mr Mann's trips were sponsored by foreign governments and most were related to his role as the UK chair of the Inter-Parliamentary Committee Against Antisemitism. 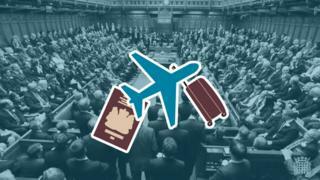 Rachel Davies Teka, head of advocacy at Transparency International UK, which argues for a ban on foreign government-sponsored travel by MPs said the figures represented "an obvious risk of undue influence over our democratic processes". Production by Daniel Dunford, Alexander Ivanov, Debie Loizou and Joy Roxas. Map built using Carto.